1) Lawrence E. Joseph, Apocalypse 2012: An Investigation into Civilization's End (New York: Broadway Books, 2007), page 12. 2) Synthia Andrews and Colin Andrews, The Complete Idiot's Guide to 2012 (New York: Alpha, 2008), page 11. 6) Pauline O'Connor, "12/12/12: The end of the world as we know it?" Los Angeles Times, February 28, 2008, http://theguide.latimes.com/general/12-12-12-the-end-of-the-world-as-article, accessed on October 16, 2009. Interesting post. 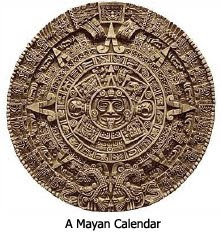 Your image of 'A Mayan Calendar' however is not from the Maya culture but is the Aztec sun stone. It's quite mysterious why most purported images of the Long Count show the Aztec Sun Stone, which was not accurate at all. 2012. Brought to you by the people who gave you the Y2K Millennium Bug. 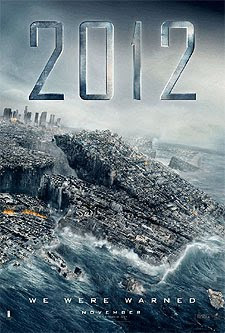 The only thing that's going to follow 12/21/2012 is 12/22/2012. My big question, though, and hopefully someone can answer, is this: If the world is going to end on 12/21/2012, why are we so worried about the environment? I'm proud to say I wasn't fooled by "Global Warming" or "Climate Change". These farces are another way some put PEOPLE in control of weather instead of the only One in control of weather - God! Temperatures, earthquakes, volcanos, storms, etc. are under the power of God and God alone! Whether they occur as natural events or judgements. Those behind Global Warming - oooops - make that Climate Change (snicker snicker - sure is a c-c-c-c-cold global warming) are probably the Love Mother Earth crowd who worship Creation instead of The Creator. Welcome back to the lower 48, hart. Hope you had a nice Christmas. So, is it safe to assume that the "climate change" hasn't really affected Alaska? I just read Hitchcock's "2012" and it's not bad. Pretty informative stuff about the so-called end of the world. as hal lindsey put it:"climate change has been happening for years, we use to know it as weather" i read his (hitchcocks) book a few months ago. alaska was alright. great to get away from work. I agree with Lindsey so much on that one, that that's what I say to people when they bring up "climate change". confess-repent and change our way of living. The signs are there - I feel something could happen. This could be an awakening but only if people heed it. The world needs changing. If such a scare(no matter real or false)is needed- so be it.